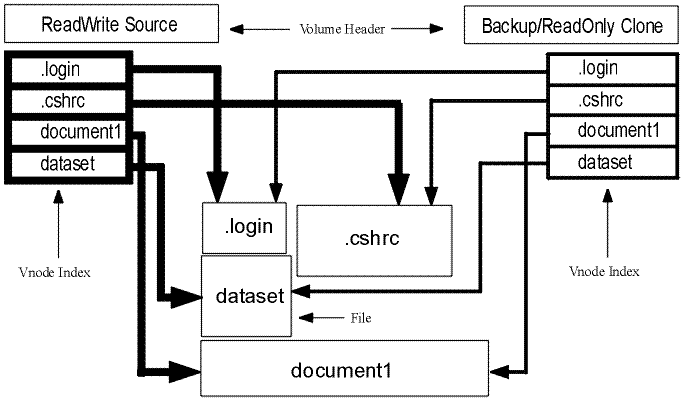 To create a backup or read-only volume, the Volume Server begins by cloning the read/write source volume to create a clone. The Volume Server creates the clone automatically when you issue the vos backup or vos backupsys command (for a backup volume) or the vos release command (for a read-only volume). No special action is required on your part. A read-only volume that occupies the same partition as its read/write source (also known as a read-only clone), and a backup volume, are created by attaching a volume header to the clone. These volumes initially consume very little disk space, because the clone portion (the vnode index) points to exactly the same files as the read/write volume, as illustrated in Figure 1. The file sharing is possible only because the clone is on the same partition as the read/write source volume. When a file in the read/write volume is deleted, it is not actually removed from the partition, because the backup or read-only clone still points to it. Similarly, when a file in the read/write is changed, the entire original file is preserved on disk because the clone still points to it, and the read/write volume's vnode index changes to point to newly space for the changed file. When this happens, the backup or read-only volume is said to grow or start occupying actual disk space. A read-only volume that does not occupy the same site as the read/write source is a copy of the clone and of all of the data in the read/write source volume. It occupies the same amount of disk space as the read/write volume did at the time the read-only volume was created.